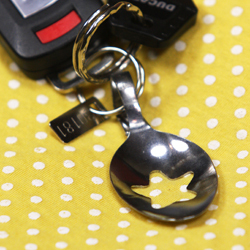 In this article, I share a nifty tutorial on how to make a spoon pendant (as well as a few other variations made with the same process!). My inspiration was this project by Craftster member rhodora. 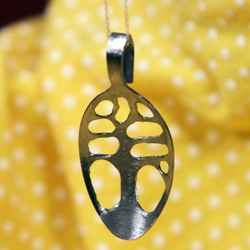 rhodora used a jewelry saw to create her pendant, but since I don’t have access to one, I turned to my trusty Dremel! 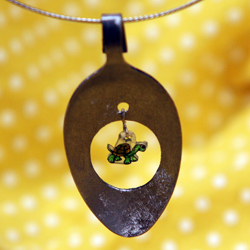 I use my Dremel for all sorts of crafty purposes such as glass etching, polishing, carving and making recycled jewelry. I’ve created some really awesome Altoid tin pieces by stripping the paint and engraving gorgeous and intricate little patterns on them with the Dremel. Around our house, I’ve used the Dremel for installing wall outlets, repair work on our motorcycles, and THE BEST THING EVER, re-slotting stripped screws. 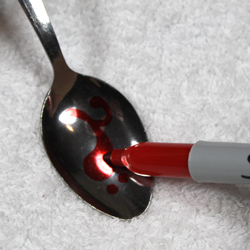 Design an image on the spoon with a marker. 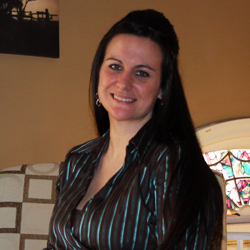 The possibilities are endless for designs! Think of abstract images, symbols, holidays or just simple and fun shapes. Cut your image from the spoon. I use a Tungsten Carbide Cutter for this step. 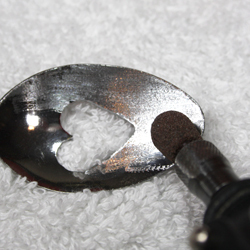 Make an initial hole in the spoon and then slowly work outward until your entire image is detailed. I find it helpful to secure the spoon in a workbench with clamps for this step. Have fun by creating swirls, texture and designs with other attachments. I like to create a hammered appearance on some of my pieces. This will eliminate any accident scratches or marks on your piece as well. 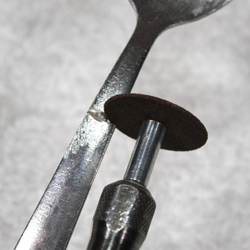 Cut the handle of the spoon with a Dremel Cut-Off Wheel. 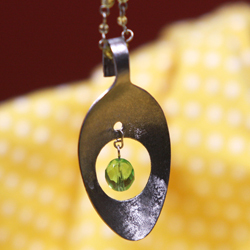 Be sure to leave enough handle to create a loop at the top of the pendant. 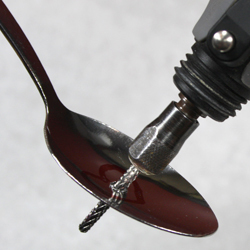 Use pliers to bend the top of the spoon to create a loop. 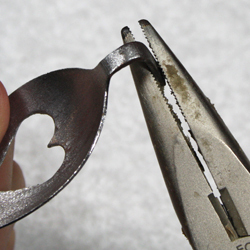 Depending on your strength and the thickness of your spoon, you may need to use gloves or two pairs of pliers for this step. Make your bends slowly. Be careful not to bend back and forth too quickly or you might break the neck of the spoon. 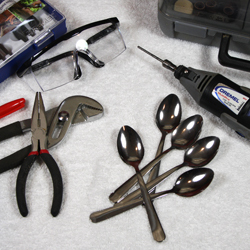 If the pliers make marks on your spoon, just repeat Step Three. 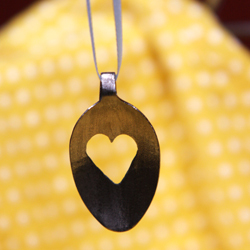 Add a ribbon, chain or cord and your necklace is complete! I’ve been needing a reason to go out and buy silverware to play with. I’ve also been needing a reason to use my Dremel. now I have one!!!!!! this is a fantastic idea! thanks for sharing! Lovely! I always hear about Dremels but didn’t know all the ways they could be used! Yay, glad you guys like it! They’re so easy and fun to make. You’re obviously skilled with the dremel, but in case you’d like to be able to add finer detail (eg. corners at the edge rather than curves), a jeweller’s saw’s actually not that expensive an item. I’m in Australia, so prices may be different, but maybe $50? The blades themselves can add up, but that really depends on how much and how well you use them (you’ll find they break a bit till you get used to them). Thanks, Gab! That’s really good info! I have so many bits and attachments for the Dremel that I tend to try to make it work for so many random uses. I’ll have to put a jeweler’s saw on my crafty wishlist, too! Cute idea! I’ve used hubby’s dremel for many things, but this one would be the most fun! These are all great projects, and I too use my Dremel for everything! PERFECT TIMING!!!!! DH just got me a Dremel for my birthday a couple of weeks ago and I remembered this project but could not find it – as soon as I get some time, I will be playing with my Dremel and this will be one of the ways! Thanks! yet another reason to run out and buy a dremel! <3 great idea!! I have been using my dremel mainly for gourd projects but this idea is awesome! I will definitely try my hand at making some of these….Thanks for the inspiration! I couldn’t help but to mention this on my blog. This year I couldn’t figure out the one thing I really wanted for Christmas, until I saw your necklaces. Now I want a Dremel!!!!!! Wow, thank you so much, Sharon! These are really fun, quick and so easy to make. The possibilities for designs are fairly endless, too! I ended up making quite a few while taking pictures for this tutorial. I would love to see more dremel tutorials, as it is sometimes not clear HOW MUCH you can do with it. Cool! These are sooooooo awesome! I love my Dremel! I am going to have to make some of these! Also just an FYI on the spoons, you can get a 5 pack of the Cheapo spoons for a dollar at Wal-Mart! Also forgot to mention that if you make a mistake when you are drawing with your Sharpie, rubbing alchohol on some cotton or tissue will take it off. You could probably wrap the jaws of the pliers with masking tape to prevent scratches, or buy the ones with the nylon jaws. Last year someone was filling spoons with resin. You could combine the two or melt some plastic in it! I wanna try that glass etching with a Dremel. Please can you tell me what kind of bit you used excatly?! there are sooo many differetn types of Tungsten Carbide Cutters:( i would really appreciate it!! There is no model or style # provided for it in the manual, but here is Dremel’s page for this type of bit http://www.dremel.com/en-us/AttachmentsAndAccessories/Pages/CategoryProducts.aspx?catid=72&catname=Tungsten+Carbide+Cutters There are only nine available and it’s definitely not one of the five pointed ones, so that brings it down to four options. Basically, you’re looking for something that will allow you to grind sideways to enlarge the hole. Found this. I believe its the same exact one you used! It is a really cool! Of course, after I saw your blog, I had to pull out my Dremel and flexshaft and try it. Is there a way to prevent getting pummeled by the metal in the first place? I tried wearing a long sleeved shirt, but there is always skin exposed. I have also decided to wear a particle mask while I do this project, just to make sure none of the miniscule metal shards enter my lungs. I got some spoons today. Already have the dremel. Then ivreslized the spoons are stainless steel. Will that be a problem? Can’t wait to try it! !! Thanks for your inspiration. Hi, Beth! I didn’t have any issues with slivers. How about pairing gloves (thick work gloves) with a long-sleeved shirt? Hello, Sue! Not at all! That’s actually what I used, too. Have fun! Can’t wait to see what you create! This is incredible. I can’t believe I haven’t see this before. Thank you so much for the info and inspiration. I have all the tools in my game-room except a tungsten cutting tool/bit? Maybe I can find at Lowe’s? MY 4 year old daughter is so excited to work on these projects with me (not the dremel parts of course) and I designing ideas right now! Hi! Great idea and t.y. so much for sharing! I needto know is the bit you used the one that originally came with my dremel?? Dont want to tare it up if it’s not the rite one! Thanks! i got the dremel 3000 and the cutting disc I used came in the box with all the other attachments, still not sure what’s the proper word to use when talking about my dremel. The disc cut my fork and spoon perfectly, I keep looking for things to do with my dremel, LOVE IT!!! It’s SO much fun. Addicting! 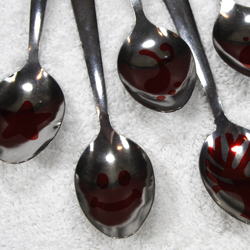 If you are using silver spoons you can make the metal softer by heating in to a cherry red and then quenching it in cold water. This will also blacken the silver but you were going to polish it when you had finished making it. This is so neat, I know were to get all the silverware I want, to play with. I don’t wear ring’s or bracelets anymore, but Kids, and grandkids does, make a good birthday present. Thank you for the post. You’re welcome, Pattsy! 🙂 Enjoy! You are AMAZING!!! I just about killed myself using my Hitachi drill to make a hole in a spoon. I couldn’t believe how much I was struggling to make a hole. So now I know I need a Dremel drill. Where can I find one? Are they very pricey? Harbor Freight has dremel kits at a real good price. If you sign up for their emails,you can get a real great deal. I bought mine there. Oooh, good to know! There’s one just a few minutes from my house, too! Haha! #keeper Have you made anything with it yet, Leslie? I am so thrilled to have found your Dremil instructions. Years ago my husband got me a Dremel along with countless accessories for Christmas. I used it for several projects while remodeling our kitchen,by myself,while my husband from back surgery. Now I’m disabled and spend too much time in my recliner. I recently decided to start making silverware jewelry but didn’t know how to start. I’ve been collecting silverware from estate sales and antique stores for a couple of years. Now it’s time to start! Thank you for showing me how I can use my trusty Dremel to make something beautiful! Ooh, I can’t wait to see what you create with it!